The hardest part about ice fishing is facing the winter terrain. When an unexpected storm or strong winds come, you can either pack up and head home or brave the harsh conditions. 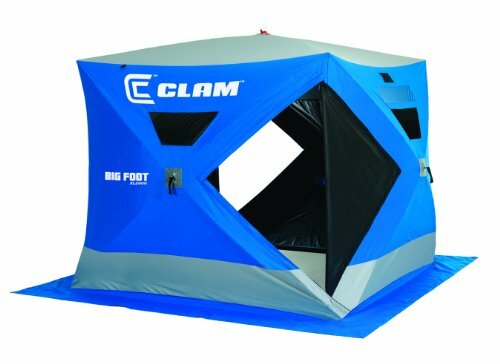 A great option to make ice fishing less about endurance and more about enjoying yourself is to use the best ice fishing shelter. Ice fishing shelters protect you from the elements and let you ice fish in comfort, regardless of what is going on outside. 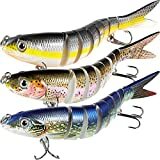 Below, you will find our top 5 choices in ice fishing shelter, as well as a buyer’s guide for ice fishing shelters, so you know what to look for as you decide what to buy. Do not forget to keep your feet warm with some nice ice fishing boots. Or help cut that hole with a Electric Ice Auger. If you have a lot of gear to carry, the last thing you want is a shelter that is going to add to your load. 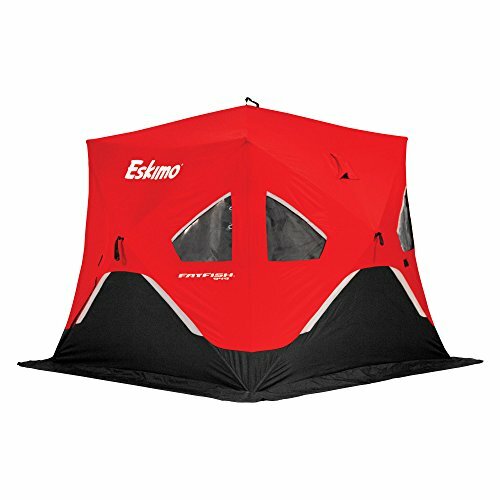 The Eskimo QuickFish 3 is lighter than any of the others on the list because it does not have insulation, but it still keeps you warm with a heater or in mild winter conditions. 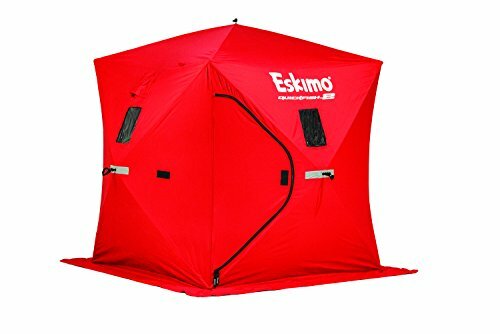 This Eskimo pop-up ice fishing shelter really does ‘pop’ out to assemble the tent in less than a minute (even if it is windy outside). It helps keep you warm, even when using the model without insulation by cutting back on exposure to wind and the elements. It can also become quite warm if you use a heater. It is also roomy enough for 2 people or 3 people with minimal equipment. Its dimensions are 70” x 70” x 80”. Even though it is tall, the 2 doors located on either side of the tent are a little short. It has 2 ventilation holes, 4 windows that will not fog up with heat, and flaps on all sides of the shelter that let you secure them with snow, preventing wind from ripping through your tent. It is just 26 pounds, making it the lightest shack on this list that you can toss over your back and head out to the ice with, hassle-free. Unfortunately, it is not as easy to get the shelter flat enough to slide back into the cinch sack when you are done using it. This large shelter is ideal for trips with a few buddies or the family. It has six large windows that you can open or remove completely for plenty of fresh air and storage pockets so it doesn’t feel cramped. If you want a large shelter for ice fishing, this is a great choice. It is 94” x 94” x 80” tall. You don’t have to worry about everyone fighting over who has to carry it, because it is a lightweight 27 pounds. It is also easy to set up and flares out at the bottom, which provides more fishing space. Even though it is room, however, the doors are small. 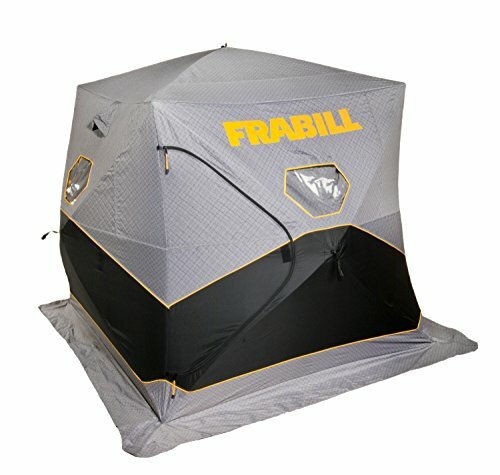 This fishing shanty has insulated fabric to keep everyone warm and is durable, with two layers of high-thread count woven fabric and an IceTight Insulated fabric in the middle. It also has six large windows, heavy-duty anchors, and useful mesh storage pockets. Even though this model can reduce wind by 90%, heavy winds can cause the sides to cave in slightly. Additionally, it can be hard to fit the shelter back in the bag after the material has been stretched and tightened all day. This is a great hub-style portable ice shelter if you are on a tight budget. It easily fits 2-3 adults and has 6 ice anchors to keep it secured. This roomy tent is 80” x 80” x 80”. It is budget-friendly, costing half the price of some other tents on this list. Its insulation is unique, with thick layers on the side to keep the wind out and lightweight insulation on top, which prevents the tent from getting too hot when used with a heater. It also has removable windows and 2 doors on either side of the shelter. It is easy to set up and take down. It is also sturdy, with tough fabric and six anchors to keep it in one spot while you are out on the ice. Additionally, the positioning of the anchor hubs withstand wind well and keep the sides out, even when fast winds are bearing down on them. Though it comes with plenty of anchors, they could be a little stronger and easier to put into the ice. This shelter is also a little heavy for its size. This is another easy-to-set-up tent, with many people reporting set-up taking just thirty seconds. It also has incredible amounts of storage space inside. Though this is sold as a 3-4 person tent, its dimensions are only 70” x 70” x 80”. However, it makes up for some of the lack of space with an overhead storage area and several mesh pockets for storage on the sides of the shelter, which frees up some space for moving around. The carrying bag that comes with this is nice, because it has a wide opening that makes packing up a breeze. It is nearly 5’ long and is designed like a backpack, so it is a little bulky, but it is easy to carry. Set up is easy, as long as you do not have trouble reaching the straps that pull the sides of the shack out. This is a warm ice fishing shelter with three layers of insulation. This shanty can be used with a heater, because it has 4 ventilation pockets at the top of the tent and removable windows. One downside regarding the windows is their positioning, since most people will need to stand to see out of them. They also may fog up in cold weather. Dimensions: 70”x70”x80”: Giving 34 Square Feet of Internal Room! 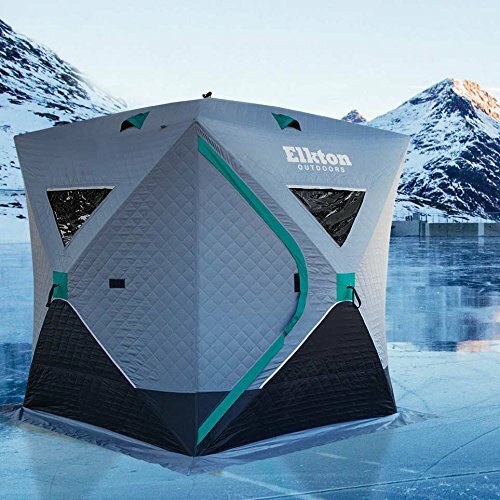 This portable ice fishing shack will withstand years of harsh winter weather, with tough outer fabric and poles that have been tested for strength. Sturdiness can be found in all areas of this 90” x 90” x 80” fishing shelter, which is designed to give groups of 4-5 people plenty of room. Its poles have been flex-tested and tested for strength and the fabric is 600 dernier, which is very durable. It also comes with 8 anchors for securing it to the ice, which is more than the average 4-6 that are included. Some features of this hub-style shelter include windows, triple-layer storage pockets in the corners of the shelter, a skirt that you can stack snow on to keep wind out of the tent. The windows are not removable, but there is Velcro secured along either side of the two doors that you can use to secure them open. The fabric is a little heavy, weighing 35 pounds. It comes with a carrying bag, but is bulky. Despite this, the shelter is easy to set up. The thick fabric also keeps light out well, so you can easily bring along a cot or tarp and sleep on long trips. What to Consider When Purchasing an Ice Fishing Shelter? When ice fishing, your focus should be on having a good time—not braving the elements or trying to keep moving to stay warm. Before purchasing a shelter, be sure to consider the following things. Flip-style – This type of shelter can typically hold between 2 and 4 people. It is designed with a strong plastic shed base for easy transportation. Windbreaker – These are created with lightweight ice fishing shanty designs, which protect from the wind but will not do as good of a job protecting from the elements. Cabin-style – Usually, cabin style shelters are made to stay erected after use. They are similar to flip-style, but are not easily taken down. Hub style shelters – The hub style shelters are built with great design and they come with a perfect look which is similar to a camping tent. Is ice fishing your alone time or do you bring along your spouse or friend? One of the most common sizes of tent will accommodate 2-3 people, but can also be used on solo expeditions. There are two things that you want to consider regarding size. First, think about how much space you will need for your gear and the people you want to accompany you. Even 2-3 man shelters can become crowded if three adults are packed inside with a lot of gear. Second, consider the height of the tent and if you will be able to stand comfortably inside. One of the advantages of the pop-up fishing hut is that they are generally made easy to set up. Usually, just by pulling a few handles placed on the fabric the entire tent will open up and be ready to use. If you are going to be out on the ice alone, you should make sure that the fishing shanty that you have chosen opens easily enough. When considering how the bag can be stowed away, you think about how easy the shelter is to take down and if it fits well in the case or bag that is provided to store and carry it in. 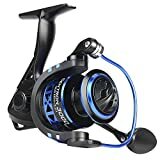 Who wants to carry an extra 50 pounds when they are already lugging around a cooler, rods, and other ice fishing gear? This is the advantage that flip-style and cabin-style shanties have—they already come attached to a sled that you can bring along with you. Fortunately, even pop-up shelters are usually lightweight. They are usually between 20 and 30 pounds. Carrying bags are another option. Some come with duffel bags and others come with backpacks, usually included. The materials used while constructing the shelter will affect its insulation, weight, durability, and cost. If you tend to go out in rough weather, you will want a heavy-duty shelter for ice fishing that can withstand wind, snow, and ice. When considering the thickness and durability of fabric, you will come across a term called ‘Denier’. Higher numbers represent a higher rating of durability and thickness, so a 600 denier fabric will provide better protection than a 300 denier fabric. While heavier fabric is a good thing in terms of warmth and durability, it also usually means extra weight and a higher price, so there is that to consider as well. Many people bring along portable heaters, which keep a mildly insulated shack quite warm. Some winter conditions are blustering winds, which can easily blow the average tent around if it is not secured. Most fishing shelters use tie downs and anchors to ‘screw’ into the ice and secure the tent. Even so, those without a floor might flap up and let cold drafts in when it is windy. To prevent this, look for a shelter that has flaps on the outside that you can bury with snow to hold them down. Finding a shelter with a durable frame and tight fabric can also help. Some models that you pick up will have flooring, while others are left open, so you can place the fishing hole inside the tent. Others have built-in seats, especially flip-style fishing huts. If they are not included, you can bring along your own seat. Some ice fishers also use tarps on the bottom of their tent. It is hard to stay focused and relaxed while fishing if you are worried about being too hot or cold. Ice fishing huts commonly have some type of insulation, but there are some models built with no insulation. 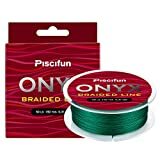 These are great for people who just want to get out of the wind. Things like the materials used to insulate and how thick the layer of insulation is will affect how heavy and warm the shelter is. Ventilation is also something to consider, especially if you are going to bring a heater to use during your trip. It cycles out the stale air in the shelter. Most shelters that have ventilation have flaps near the top or sides of the tent that can be open or shut, depending on your preference. Most ice fishing shelters have one door on either side of the tent, so people do not have to worry about stumbling over others and their gear to get outside. The size of the door may make a difference, especially if you are a taller person. Some brands have windows that you can see out of or cover up, while others open or are completely removable. If you have windows, try to choose those made of a material that won’t fog up if you have a heater running inside. The last thing that you want is to be crowded or tripping over gear when you try to move around your shelter. 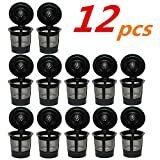 If you don’t want a larger size, another option is to find one that has storage space. Some have overhead storage areas, while others make use of gear pockets on the wall of the tent. Enduring the cold to enjoy the sport of ice fishing can be a lot easier with an ice fishing shelter. There are many things to consider when purchasing an ice fishing shelter, including your budget, how much protection you need from the elements, and how many people you commonly bring along. 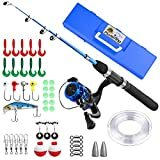 By using the buyer’s guide above and checking out the recommended ice fishing shelter reviews, you can make the most of your time out on the ice.